The Epistle to the Hebrews is one of the books in the New Testament. Though traditionally credited to the Apostle Paul, the letter is anonymous and most modern scholars, both conservative and critical, believe its author was not Paul himself but a member of the later Pauline Christian community. Written to encourage its readers not to "shrink back" from testifying to Jesus or return to Judaism, Hebrews is more a sermon than a letter. It portrays Jesus as the high priest who sacrificed himself to atone for humanity's sins, superseding the sacrifices of the "old covenant" mediated by Moses, which it characterizes as "obsolete." Jesus is depicted as a priest "according to the order of Melchizedek," whose offering is made only once, while the sacrifices of Levite priests need to be made yearly and are ineffective in any case. Only through faith in Jesus' atoning death and one's own perseverance through suffering until his reappearance will God's grace of salvation be assured. Hebrews also teaches the existence of a spiritual realm of which the earthly world is but a reflection. The powerful rhetorical style of the Epistle to the Hebrews made it one of the more influential New Testament books. 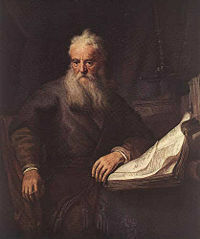 Paul of Tarsus, the traditional author, as depicted by Rembrandt. Most scholars today do not believe Paul was the author of the Epistle to the Hebrews, which was written anonymously. The author of Hebrews is not known. The text as it has been passed down to the present time is internally anonymous, though ancient title headings often attribute it to the Apostle Paul. However, even in antiquity doubts were raised about Paul's authorship. The reasons for this controversy are fairly plain. First, all of Paul's other letters contain an introduction that claims Pauline authorship, yet Hebrews does not. Also, while much of its theology and teachings are considered Pauline, Hebrews contains many ideas which seem to have no such root. For example, salvation does not seem to come at the time of baptism, but only by waiting faithfully for Christ's second coming (9:28). Moreover, this writer goes much farther than Paul in divorcing Christianity from its Jewish roots, declaring not only that Gentile Christians need not become Jews, but that the "old covenant" itself is both flawed and obsolete. Moreover, the writing style is substantially different from that of Paul's authentic epistles, a characteristic first noticed by Clement of Alexandria (c. 210). In addition, Hebrews admits to have been written by a person who received the Christian message from others, while in his letter to the Galatians, Paul adamantly insists that he received his gospel directly from the resurrected Jesus himself. In response to the doubts raised about Paul's involvement, other possible authors were suggested as early as the third century C.E. Origen (c. 240) suggested that either Luke the Evangelist or Clement of Rome might be the author. 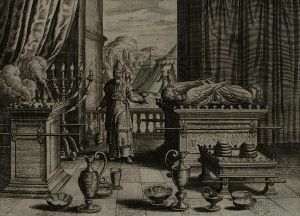 Tertullian proposed Paul's companion Barnabas. The King James Bible 1611 ed. ends the Epistle to the Hebrews with "Written to the Hebrewes, from Italy, by Timothie." Nevertheless, in the fourth century, the church largely agreed to include Hebrews as the fourteenth letter of Paul. Jerome and Augustine of Hippo were influential in affirming Paul's authorship, and the Catholic Church affirmed this authorship until the Reformation and beyond. Arguing in favor of Paul's authorship are such factors as the letter's basic Pauline theology, many Pauline themes, the use of language often similar or the same as Paul's, and a reference to Paul's frequent companion Timothy in the closing lines. During the Reformation, Martin Luther proposed Apollos—"a learned man" (Acts 18:24), popular in Corinth (1 Cor 1:12), and adept at using the scriptures and arguing for Christianity while "refuting the Jews" (Acts 18:27–28)—as its author. In more recent times, some scholars have advanced a case for the authorship of Hebrews belonging to Priscilla or Silas. In general, the evidence against Pauline authorship has convinced most scholars that the letter is not by Paul, an attitude shared by conservative and critical scholars alike. The original readers of the letter were apparently conversant in the Septuagint translation of the Old Testament, as the author's usage shows. The types of sins listed in chapter 13 suggest they lived in a city. They had once faced persecution (10:32–34), but not to the point of shedding blood (12:4). Some had stopped assembling together because of persecution (10:25). In 13:24 the author says that those from Italy greet the readers, taking by many scholars to imply that its audience may have been located in Rome. The letter's audience is often thought to be Jewish Christians, although recent scholarship sometimes question this presumption. In either case, Hebrews affirms that non-Jewish followers of Jesus do not need to convert to Judaism in order to share God's covenant, but it is even more concerned to show that the "old covenant" itself is obsolete. Hebrews has been dated to shortly after the Pauline epistles were collected and began to circulate, c. 95 C.E., but this is far from certain. Hebrews is a very consciously "literary" document. The purity of its Greek was noted by Clement of Alexandria, and Origen asserted that every competent judge must recognize a great difference between this epistle and Paul's (Eusebius, VI, xxv). However, Hebrews does not fit the form of a traditional Hellenistic epistle, lacking a proper prescript. Modern scholars generally believe this book was originally a sermon or homily, although possibly modified after it was delivered to include the travel plans, greetings and closing (13:20-25). However, others suggest that it may once have contained an opening section more typical of a letter, which was later lost. This letter consists of two strands: an expositional or doctrinal strand (1:1–14; 2:5–18; 5:1–14; 6:13–9:28; 13:18–25), and a hortatory or ethical strand which punctuates the exposition parenthetically at key points as warnings to the readers (2:1–4; 3:1–4:16; 6:1–12; 10:1–13:17). 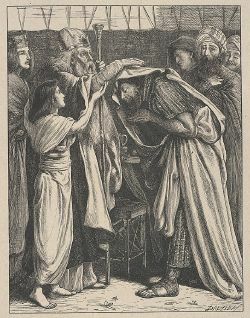 Melchizedek blesses Abraham: Hebrews call Jesus a priest according to the order of Melchizedek. As a faithful son of God, Jesus is worthy of even greater honor than Moses. Those who know him must not lose faith and turn back, like those Israelites who rebelled against Moses and wished to return to Egypt. (Chapter 3) God has promised a Sabbath to those who are faithful, and today that promise if fulfilled to those found worthy to enter his "rest." Jesus is the great high priest of the current era, who was tempted like all of us yet found without sin, so we may approach God's throne with confidence of His grace. (Chapter 4) Jesus' priesthood is of the "order of Melchizedek." The writer's audience has been too immature to learn much more of this, being like infants who need "milk, not solid food." (Chapter 5) Now it is time for more advanced instruction. Hebrews left an important legacy both theologically and in terms of its social impact. One of its most famous verses is its definition of faith as "the substance of things hoped for, the evidence of things not seen," (11:1 KJV) which has come to be firmly associated with Saint Paul, although few scholars today believe it belongs to him. Its portrayal of Jesus as the high priest who offered himself for the redemption of the sins of those who believe became emblematic in Christian theology. So too did Hebrews' characterization of the distinction between the "old" and "new" covenants. Indeed, some trace the origin of the term "New Testament" to this writing. In portraying the "old covenant" as flawed and obsolete, the author also set the stage for Christianity's ultimate divorce from Judaism. 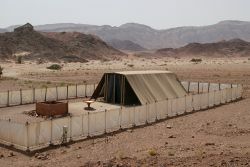 Just as Hebrews exaggerated Paul's criticism of the Jewish law, later Christian authorities would exaggerate Hebrews' attitude to the point of characterizing Judaism as rejected by God, forbidding Christians from associating with members of the synagogue, and even justifying the persecution of Jews. Hebrews is also important because of its view of the heavenly realm. This attitude influenced the later development of Christian Neo-Platonism, as well as fostering the belief in conscious survival of the conscious human person in the afterlife. Its powerful rhetorical style and clear summary of Pauline themes, even if overstated, made it one of the most influential of "Paul's" letters in the second century church and throughout much of Christian history. ↑ A number of manuscripts, namely the earliest extant (P46), bear the title of simply, "To the Hebrews," without Paul's name. ↑ Eusebius, Church History 6.25.11-14. ↑ This may be a reference to those who eat food sacrificed to idols, a practice banned in the early church. All links retrieved March 8, 2019. Goodspeed's analysis of Hebrews earlychristianwritings.com. Catholic Encyclopedia: Epistle to the Hebrews newadvent.org. 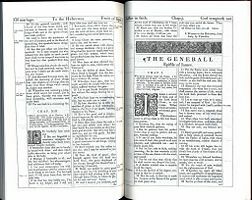 History of "Epistle to the Hebrews"
This page was last modified on 8 March 2019, at 21:47.